North Koreans have been voting in a five-yearly election to approve members of the rubber-stamp parliament, the Supreme People's Assembly. Each of the 687 districts had only one candidate running for office, with electors required to write only "Yes" or "No" on the ballot paper. Campaign posters across the capital, Pyongyang, urged a "Yes" vote. Observers say the candidate list is an opportunity to see who is in or out of favour with the leadership. The North Korean vote is a ritual, the result of which has already been largely determined. The Supreme People's Assembly meets rarely and has very little power but you would not know it from the official turnout. There is only one candidate for each district, and one name on each ballot paper. The democratic duty for the electorate is simply to write "Yes" beside it. Writing anything else might be seen as treachery, rather than democracy. That is especially true if you live in the district of Mount Paekdu - the constituency of current North Korean leader, Kim Jong-un. State media have devoted entire reports to the excitement of voters at the Mount Paekdu polling station, on seeing his name on the ballot paper. The only real value in these polls, analysts say, is in watching for any signs of change in the list of state-approved candidates. In the last election in 2009, turnout was 99%, with 100% of votes in favour of the given candidates. The election is the first to be held under the leadership of Kim Jong-un, who came to power in December 2011 after the death of his father, Kim Jong-il. Mr Kim was registered as a candidate in Mount Paekdu, venerated in party propaganda as the birthplace of Kim Jong-il. 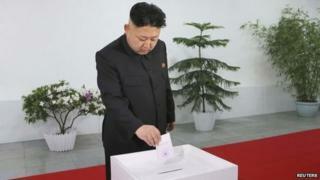 The leader was shown on state media casting his ballot in Pyongyang. The vote was held in a holiday atmosphere in the capital, Pyongyang, with performances taking place in the street. "Through this election we will fully display the might of the single-hearted unity of our army and people," said Hyon Byong-chol, chairman of a preparatory committee for one of the sub-districts in the election. He told the Associated Press news agency that North Koreans were "firmly united" behind their leader. Pyongyang resident Ri Song-gun told AP he had cast his vote of approval for his district's candidate. "I will devote all my intelligence and strength to fortify our socialist system centred on the masses, which was built and developed by our great generalissimos," he said. The vote comes three months after the brutal and sudden execution of Mr Kim's once-powerful uncle, Chang Song-thaek. North Korea announced on 13 December it had executed Chang after convicting him of "acts of treachery".